Lee Sallows recently created a new site, geomagicsquares.com, about geometric magic squares. 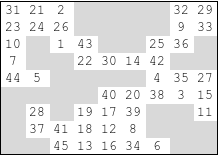 These differ from standard magic squares in that the numbers are replaced with shapes, and instead of having a magic sum which all of the rows, columns, and main diagonals must add up to, they have a target shape that the shapes in each row, column, and main diagonal must tile. (As in standard magic squares, each entry in the square must differ from all of the others. I really recommend the site highly; the presentation of the geometric magic squares is nearly as beautiful as the underlying mathematics. Many (but not all) of the geometric magic squares there use polyominoes or other polyforms. Several years ago, I came up with a different way of combining polyominoes and magic squares. 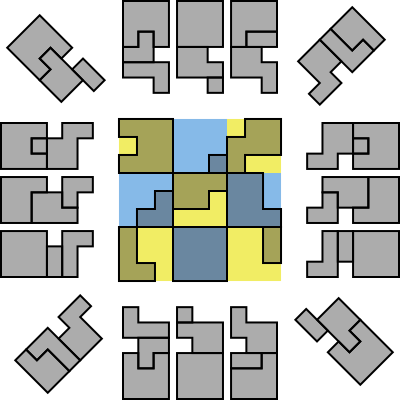 My magic 45-ominoes are polyominoes contained in a 3×3 configuration of 3×3 blocks, such that each row, column, and main diagonal has 5 cells within the polyomino, and each 3×3 block has a number of cells corresponding to a number in a magic square. The rows and columns in the diagram all contain 5 cells. I wasn’t able to make the main diagonals work out. Maybe you can? #20: Find a geomagic square of polyominoes that can be presented in a 3×3 grid of 3×3 blocks as above, where all rows, columns, and main diagonals have an equal number of cells that are contained within polyominoes. Ggaaaggh. Should I be using brackets around my tags? Nice! I fixed the formatting by putting <pre> tags around it. I… I thought I’d done that. Maybe I can’t do it. Oops. You’re right; WordPress strips <pre> tags by default. That should be fixed now. I’ve also added a display of the allowed html tags below the comment box.